Elizabeth Warren continues to be stoked about the Wells Fargo scandal. She wants CEO John Stumpf to step down and return all the money he made while Wells Fargo was creating fake accounts. In a series of tweets Wednesday morning, the Massachusetts Senator said Wells Fargo's (WFC) decision to claw back $41 million of Stumpf's pay is a "small step in the right direction, but nowhere near real accountability." 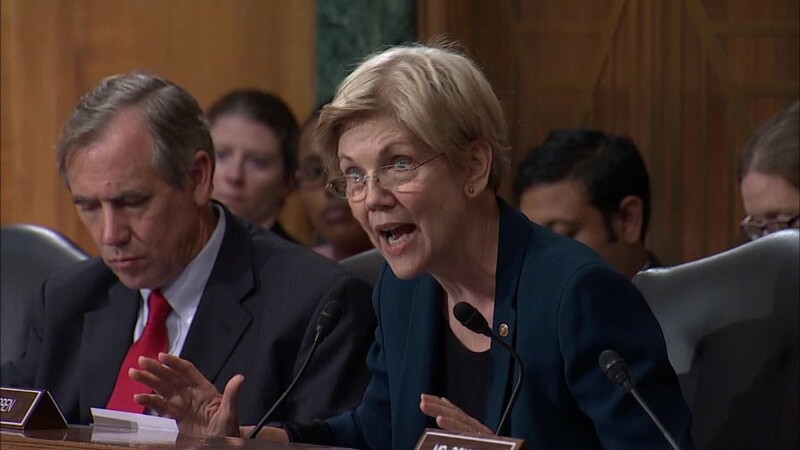 "Stumpf will be just fine: he keeps his job & most of the money he made while massive fraud went on under his nose," said Warren, just a week after her epic take down of Wells Fargo's CEO for his "gutless" leadership at a Senate hearing. Warren once again called on Stumpf to resign, "return every nickel he made while this scam" was taking place and face investigations from both the SEC and the Department of Justice. The tweetstorm is a sign of the uphill battle facing Wells Fargo as it tries to put out the firestorm engulfing the bank. Lawmakers are expected to continue to grill Wells Fargo at Thursday's hearing in front of a House of Representatives committee.
.@WellsFargo CEO Stumpf will be just fine: he keeps his job & most of the money he made while massive fraud went on under his nose. Wells Fargo took more forceful action late Tuesday by announcing Stumpf will forfeit $41 million in stock awards, forgo a 2016 bonus and not be paid a salary while the board conducts a new investigation into the fake account scandal. But Warren sees a double standard in Stumpf's ability to -- so far -- hold onto his job. "Employees who failed to meet management's outrageous sales goals were fired," Warren said. And Wells Fargo workers who "tried to sound the alarm about the creation of fake accounts were fired. Their lives turned upside down," Warren said. Warren was echoing claims by several former Wells Fargo workers who told CNNMoney they were terminated after calling the bank's ethics line about illegal sales tactics. "They ruined my life," said Bill Bado, a Pennsylvania banker at Wells Fargo who was fired in 2013 for tardiness eight days after sending an email to HR detailing the opening of unauthorized accounts.
.@WellsFargo employees who failed to meet management's outrageous sales goals were fired.
.@WellsFargo employees who tried to sound the alarm about the creation of fake accounts were fired. Their lives turned upside down. At Thursday's hearing, Stumpf plans to once again apologize for the creation of as many as two million unauthorized accounts, according to prepared remarks obtained by CNNMoney. The Wells Fargo CEO is also expected to say the bank will scrap the controversial sales goals that workers blame for the fake accounts on October 1, three months earlier than previously planned. Warren didn't weigh in on Carrie Tolstedt, the Wells Fargo executive who led the division that created fake accounts. Wells Fargo said she was leaving the bank and will give back $19 million in stock awards after a national outrage over her compensation. However, if further action isn't taken, Tolstedt could still walk away with $77 million in stock options and shares she accumulated over her two decades at Wells Fargo.